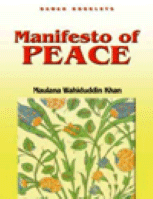 In the book Manifesto of Peace Maulana Wahiduddin Khan explains that peace is the only religion for both—man and the universe. In a peaceful environment all good things are possible, whereas in the absence of peace, we cannot achieve anything of a positive nature, either as individuals, or as a community. The same holds true at national and international levels. He, further, explains that while peace is the absence of war, some people hold this definition of peace to be inadequate.